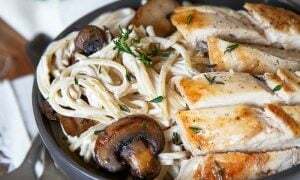 Engagement chicken pasta is a creamy mushroom chicken pasta for two. 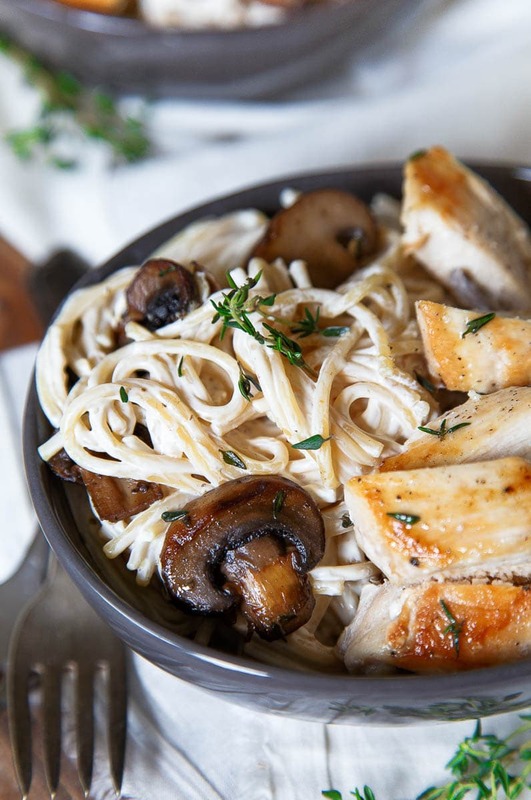 This creamy pasta dish with seared mushrooms and sliced chicken will impress anyone! The other day, Joy got me thinking about Engagement Chicken. Not only how silly it is, but also how important food is if it can garner such a response. Truthfully, I never made engagement chicken until I was married, but I have made it, and yes, it’s freaking fantastic. But it’s not just that–it’s a life skill learned in trussing and roasting a chicken..which is probably why they say if you can roast a chicken, you have marriage skillz? I do not know. Let’s not assign good meals to married folk only. A good meal deserves a place in your wheelhouse. This pasta is one of those impressive dishes that you should master and keep in your back pocket for a special occasion. (By the way, a special occasion is mopping and vacuuming your whole house, instead of doing one or the other. Or, Tuesday. Tuesday works, too). After I deglaze the mushroom pan with a hefty dose of wine, I pour the hot wine into a big bowl for tossing the pasta. Then, I add the cream cheese, cut into cubes. Top with the hot pasta, right out of the boiling water, and toss, toss, toss. The cream cheese will melt and coat the noodles so lovingly. It’s the best. It’s worthy of diamonds. Or an entire bottle of wine to yourself. Whatevs. The first time you make this dish, it will be a bit of a blur. It has a handful of steps, but you’ll find your rhythm get better each time you make it. And you will be making this over and over, trust me. And you won’t be single for long, trust me. Or maybe you will. Maybe it’s not your cooking skills; maybe it’s your breath. Just sayin’. Oh, and if you’re not a mushroom fan, it’s okay; you can leave them out. I really think they create an amazing pan sauce here, but you can do whatever you like. Just make the creamy pasta portion and the chicken, ok? Add the sliced mushrooms to the skillet, and stir to coat in butter. Leave them to cook for a few minutes undisturbed so that a nice crust forms. Stir, and repeat until the mushrooms are golden brown. It will take about 15 minutes. 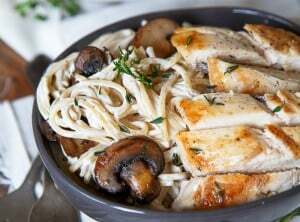 Turn the heat up to medium-high, and sear the chicken breasts on both sides in the same pan that the mushrooms were in. Again, let cook undisturbed so that a nice crust forms. If the chicken is sticking to the pan, it's because the first side isn't done searing. It will release when it's golden brown. Allow the wine to cook down slightly while scraping the bottom of the pan with a wooden spoon to get all of the brown bits into the wine. When the pasta is done, drain it, and immediately pour it over the wine-cream cheese mixture. Toss the noodles to melt and evenly distribute the cream cheese sauce. Stir the mushrooms into the pasta bowl. Slice the chicken, and serve on top. *This pasta is best served immediately after making it. The cream cheese will set up if allowed to set. Not that you can't re-heat it, but it will be t-h-i-c-k. Plan accordingly. Less dishes to do AND a fantastic creamy pasta as the finished product?! I may just propose to myself when I make this. On a Tuesday. ???? I have a strict mop OR vacuum policy. It’s just so.much.effort. i am swooned. can i marry you? Burning question: WILL YOU MARRY ME???? Sign me up!! This is similar to one of my wife’s favorite dishes + today is our anniversary….perfect timing, just sayin’!! Oh my oh my… Who am I going to cook for two? I guess all for myself and put a ring on my finger right after finished my dish. xoxo! Mmmm.. cream cheese and chicken… YES! Is there a decent substitute for white wine? I do not want to open a bottle just for it and I am not drinking at the moment – otherwise would have gladly enjoyed the rest of the bottle while cooking! Would there be a substitute for cream cheese that I could use? I have a mental block when using cream cheese in savoury dishes. As it is the only ingredient in the sauce, I would be weary of substitutions. Maybe creme fraiche? But don’t expect a rich sauce. I’ve been cooking for 30+ years, and I still can’t stand to touch them. I just take the chicken half way out of the package, and then shake it until the gizzards fall out (they are in a neat bag) then I tie a knot in the bag and throw it away (along wtih the tail). Good luck! Hi Christina, I’ve wondered off and on for many years how one is suppose to measure out 6 oz of pasta be it macaroni or spagetti if you don’t have a kitchen scale. My method is eye balling it but 9 times out of 10 I cook too much. Any suggestions? I’m making this tonight and I can’t get away from the fact that the recipe doesn’t have any garlic. Is the sauce flavorful with thyme being the only herb/spice aside from the salt/pepper on the chicken? Looking forward to dinner, for sure!!!! Thank you for the recipe and pics!!! First let me say that this recipe is great, my date and I enjoyed it very much…However, I think that an amendment to the instructions is in order. 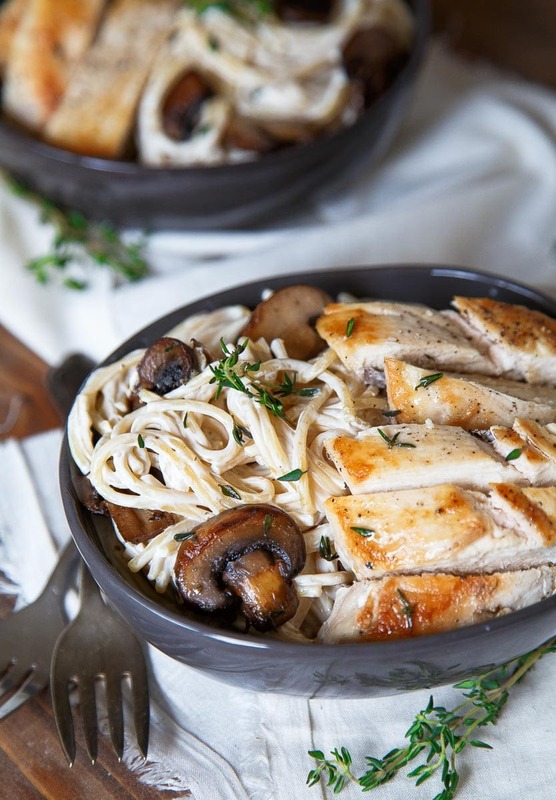 With the first step being ” cook the noodles,” it creates a literally impossible time standard for cooking the mushrooms, the chicken, the wine, and making the sauce. I found that there was a lull in my activity when the chicken was cooking, so I think that step one should be move down between steps six and seven. On my next Engagement Chicken endeavor I will be sure to make this change, and in the spirit of perfectionism, I hope you consider my suggestion. Thanks for this great recipe! Sounds scrumptious but I’m going to brave it with beef tenderloin in lieu of chicken, as the three men in my life are allergic to poultry. Valentines is just a couple of days away – cant wait to try it. Measuring pasta is never a concern in my home..my 2 boys will finish off whatever is leftover. The creamy white sauce is most delightful! I made this once before for my last boyfriend, but something seemed amiss. Tomorrow, I plan to try this again for my new boyfriend. By putting some of the extra white sauce in a turkey baster and giving myself a cream pie, without a doubt he’ll be turned on and want to marry me. Ok. So this will be my first time making this and I have never cooked with any wine but I got it anyway. Any pointers when using it?? Wow! Sounds amazingly simple yet delicious. However, my boyfriend is allergic to mushrooms. Can you recommend a substitute please for them? By the way, he’s the one I’m hoping to encourage to propose sooner considering we both do want to marry each other and this dish sounds like my secret weapon. I mean it’s been five years. How much more time does this man need? Lol. I am planning to make this tonight. What side dishes would you recommend with this meal? regular garden salad perhaps? or roasted asparagus? Instead of mushrooms is there an alternative? I honestly don’t like vegetsbles but broccoli lol. I feel ya, Quashonna! I love broccoli, too! What if you used potatoes? Broccoli would be good, too! If you are leery of mushrooms, try the baby bellas or Crimini mushrooms instead of the standard white button variety. Baby bellas are creamy tan, not white, and they have a rich, almost meaty flavor. That is why the big ones, Portobellos, are often used as a meat substitute. You can also quarter them, or even roughly chop them into smaller pieces than slices. They tend to meld more with other flavors in the dish then. As opposed to taking a bite and thinking, “Wow, that was a mushroom, whew!” It becomes more of a “This has an interesting layer to it, I’m not quite sure what it is, but it really enhances the dish! I don’t have white wine will marsala wine work or would chicken broth be better? Yes, Marsala will be fine. Chicken broth, too! Hey Christina! I tried this today and it turned out so great! Although I did add a bit more cream cheese haha. Looking forward to more posts here! Thinking of making this dish for a first date, what would be a good wine pairing? Very excited to make this tonight! Any specific cream cheese flavour I should look for or can it just be a plane one? I made this tonight and it was so delicious! Great recipe. I don’t understand how everyone who’s tried this recipe isn’t proposing to you! I just had my last bite, and yes, I licked the bowl. I have no shame. This was INSANELY good. I would even call it Last Meal Chicken Pasta because I would die happy if this were my last meal. I listened to your advise about this being best right off the stove and I planned accordingly by cutting this recipe in half and making myself one bowl. THANK YOU CHRISTINA! This looks amazing! I have been talking about learning to cook for years and decided to take the plunge finally. I think I’m going to make this for my wife this weekend! it looks easy yet delicious. Any recommendations for a good salad or side dish to pair with this? I would serve it with my Fall salad and a California Sauvignon Blanc. This was SOOOOO good and Soo easy!! I pounded the chicken a little and brined it for an hour and a half before searing and it was so tender and juicy. And the flavors were amazing!! She didn’t care for the salad but I thought it was amazing. I love your website! It is perfect for what I wanted. A weekly date night for my wife And me, and me learning to cook. I’ll be finding more recipes here for sure! !